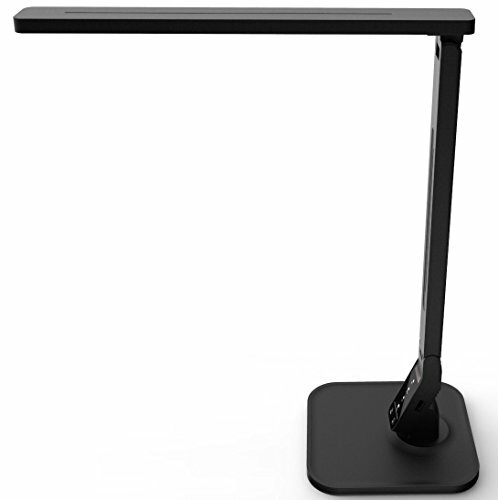 LED desk lamp with 4 lighting modes, 5 level brightness, USB charging port, 1 hour auto-off. Natural light protects eyes. LED light with dim-level adjuster providing 5 levels of brightness; 4 separate lighting modes: 'reading', 'study', 'relaxation', 'bedtime'. Icons / buttons on touch-sensitive panel control brightness, lighting mode, and other functions; automatic switch-off after 1 hour if unit left idle. LED bulbs provide up to 25 years of operation and full functionality, at normal usage. Non-glare screen protects eyes, optimizes the different options of lighting modes and dim-levels, and enables energy-efficient service. Contemporary styling and space-saving design; integrated 5V/1A USB charging port .